As a fair music buff, I'm not too bad at connecting music with composers, although like many, I get confused when it comes to the precise names of Strauss waltzes, Sousa marches and the famous last movements of Almost Anyone's Violin Concerto. Yet, I did know that Claude Joseph Roget de Lisle wrote La Marseillaise and that Fučík composed the great circus march, Entrance of the Gladiators, so I figured I was doing pretty well. But the other day I heard one of the world's most famous marches —one that "everyone knows"— and realized that (1) I didn't know the name of the composer and (2) that I had not forgotten it but had never known it in the first place! I polled a few musician friends; same result —no hits. The march is called, originally, The Parade of the Tin Soldiers and the composer is Leon Jessel (the image, right, is from 1918). That delightful march that we all know winds through some lighthearted moments on its way through the string of associations in the title of this article, but, alas, it passes through unspeakable darkness in the life of the composer. 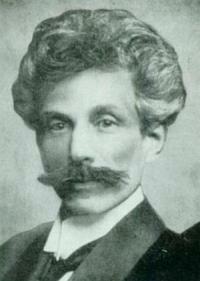 Leon Jessel was a German composer, born in 1871 in Stettin (now Szczecin, Poland). He was one of the many German and Austrian composers of the post-Johann Strauss generation, perhaps the best-known of whom was Franz Lehar. Jessel wrote two dozen operettas and many light orchestral works and songs. The only one of his operettas, however, that ever crops up, at least among the remaining stalwarts of German-language operetta, is Das Schwarzwaldmädel (The Girl from the Black Forest). It opened in Berlin in 1917 and within 10 years had played 6,000 times in Germany. Other than that, not much remains of Jessel's music except his Parade of the Wooden Soldiers. It was not part of an operetta but was composed for the piano. It is known around the world. The toy shop door is locked up tight and everything is quiet for the night. And suddenly the clock strikes twelve—the fun's begun! If you still can't hear it, listen to it! There is some confusion about names and titles. Jessel's Parade of the Wooden [or Tin] Soldiers is not to be confused with Victor Herbert's "March of the Toys" from his 1903 operetta, Babes in Toyland. The name situation is not helped by the wonderful Laurel & Hardy 1934 version of Herbert's operetta. 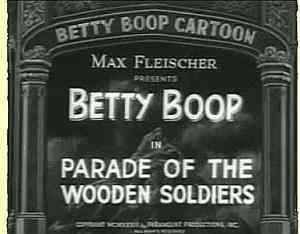 It was originally filmed as Babes in Toyland but then reissued as March of the Wooden Soldiers. Jessel was a Jew who converted to Christianity at the age of 23 in order to marry a Christian woman. They moved to Berlin in 1911, where Jessel continued his composing. He and his wife divorced and Jessel remarried in 1921. All through the 1920s and into the 1930s, his operettas were popular. The music was light but robust, and the plots fed the nostalgia for turn-of-the-century German imperial enthusiasm with such catchy songs, for example, as "We Wander through the Wide, Wide World" from The Girl from the Back Forest. As a matter of fact, that operetta was one of Hitler's favorites. In 1930 the handwriting on the wall in Germany was perhaps still unclear. Maybe Jessel thought that his conversion to Christianity and his sense of nationalism would stand him in good stead. His second wife was even a member of the NSDAP (the Nazi party). Yet, none of that helped. None of it. His works were banned in 1933. (Ironically, in that same year the German post office issued a commemorative stamp on the occasion of the first filming of Jessel's Black Forest operetta!). His wife was expelled from the Nazi party in 1934; Jessel was forced out of the Reichsmusikkammer (State Music Bureau) in 1937 and the recording and distribution of his music was prohibited. In 1939, he wrote to a friend: "I cannot work in a time when hatred of Jews threatens my people with destruction, where I do not know when that gruesome fate will likewise be knocking at my door." The goose-steppers came calling in 1941 and arrested Jessel for spreading Greuelmärchen ("horror stories") about the state. The Gestapo took him to their infamous torture chamber at Alexanderplatz in Berlin. He was then taken to a hospital where he died on January 4, 1942. He is interred at the Wilmersdorf cemetery in Berlin and remembered in the exhaustive Lexikon verfolgter Musiker und Musikerinnen der NS-Zeit (Lexicon of Persecuted Musicians in the National-Socialist Period) published by the University of Hamburg. His Parade, of course, is remembered and remains popular. The music has gone through many incarnations over the decades. It is perennially choreographed on stage and is still a favorite among dance troupes such as the Rockettes, for example, in their Christmas show at Radio City Music Hall in New York each year. The trail to Italy and Naples is via the first feature-length Italian color film, Totò a colori. The film is from 1952 and features Neapolitan comic, Totò, as one Antonio Scannagatti, a down-and-out composer who dreams of moving to Milan and cracking La Scala and the big-time publishers. 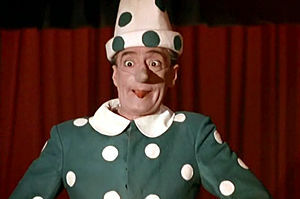 After a series of misadventures, Totò tries to flee pursuers by masquerading as a marionette (photo, right). He "escape dances" across the stage to the music of The Parade of the Wooden Soldiers. It is a masterpiece of pantomime and one of best loved and most widely-recalled Totò episodes in Italian cinema. So, there is no satisfaction in this tale, but if there is solace at all, it is that Leon Jessel lives on in that one little march that I shall never again be able to listen to in quite the same way.